Golden Salt is a magical powder made from condensing the revolutionary low-sodium, no additive mackerel fish sauce—Umasho. This salt contains abundant amount of natural amino acids derived from the mackerel which provides delicious strong umami flavors making anything unbelievably flavorful. As an alternative to soy sauce or salt, try sprinkling Golden Salt on your favorite sushi, sashimi, or grilled/fried chicken. One dash of this salt will enrich any dish! 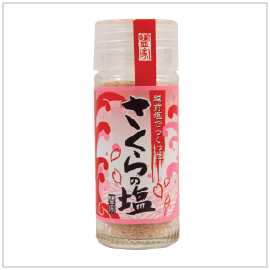 Using Echizen Sea Salt—hand-harvested, hand-made, heat-evaporated, unrefined, purely natural sea salt—as the base and blended powdered Japanese cherry blossom flower petals to make this sakura salt. Sprinkle on delicate or lightly flavored foods such as vegetable tempura or white-fleshed fish sashimi.